It’s time to reconsider the old stereotype of a trip to the dentist involving drills, multiple visits, pain, and discomfort. All of these things are no longer required to get the dental care you need to stay healthy, eliminate pain, and have a great smile. Take a look at how far dental technologies have come in recent decades. Also known as no-drill dentistry, this new method of dental care involves using a powerful but safe laser. This means that there’s little to no pain and thus little need for anesthesia. In addition, because typical comfort and pain-relieving techniques aren’t needed as much, laser dentistry is more time-efficient. Multiple procedures can thus be scheduled for the patient on the same visit. Lasers can even be used for some diagnostic procedures, such as checking for cavities, with a special device called a DIAGNOdent pen. The main disadvantage of laser dentistry is that dentists who offer it have to purchase the latest, most expensive technology and get trained to use it. Because of these expenses, laser dentistry will cost more than most other options for the same treatment. For anyone who wants a quick, pain-free, comfortable experience with the dentist, however, it could be worth it. Traditionally, dental X-rays were performed by a radiogram, but now these machines are being replaced by a new digital X-ray machine. Similar to how a digital camera improves upon a standard camera, digital X-rays are easier to process and download to a computer for comparisons with your past X-rays. Most importantly, the radiation dose received by a digital X-ray is significantly lower than that of a radiogram. 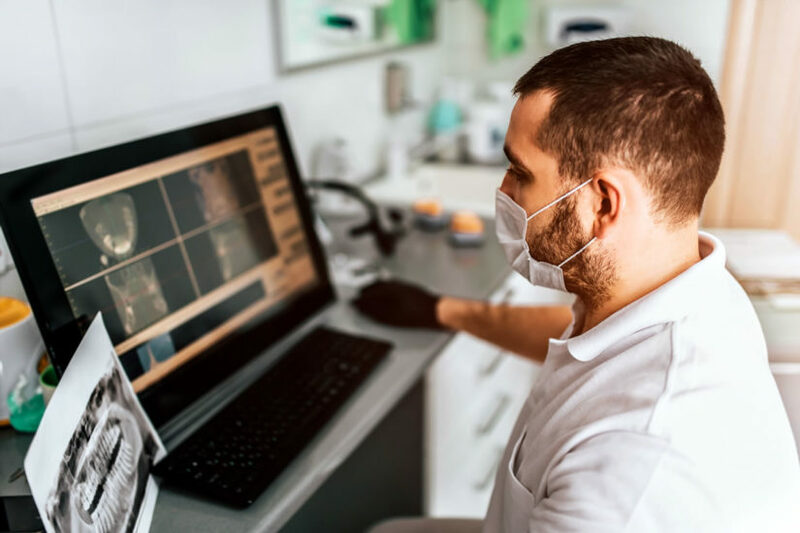 The ease and greater safety of taking X-rays thanks to digital X-ray machines make it safer for doctors to check up on dental implants, the state of a patient’s jaw, and other deep factors that can’t be seen by opening your mouth. Good dental care involves not only more effective treatments and options but also the ability to diagnose problems more easily, earlier, and with less risk or discomfort for the patient. Gums are extremely important to good dental health. Without gums fully covering the teeth, pockets can form that expose the tooth to bacteria from new positions, increasing the chance of other dental problems. For many decades, there was little a dentist could do to reverse the loss of gums from problems such as gum disease, but things have changed dramatically. There are several recent methods for reversing gum damage and any damage to parts of the teeth that gums should have been covering, such as cleaning the surface of a root of plaque. Where once the only option to restore gums was surgery to reduce the pockets, all sorts of options exist, from bone and tissue grafts to installing membranes. There are even special proteins that stimulate the regrowth of gum and inner tooth tissue. Relatively common today, veneers are a dental procedure to help with the visual element of the teeth. A thin shell, specially made by the dentist for that patient, is made to cover the front of a crooked, damaged, or otherwise unappealing tooth. The one issue with veneers in the past was that they required reshaping the tooth down in order to make room for them. Today, veneer materials have improved, making them stronger and more reliable and allowing them to be made thinner. This means that less of a patient’s tooth has to be removed to make room for the veneer and that more of the original tooth is preserved. Not only is this more natural, but it also reduces the chance of pain and other complications. Many of the methods for preparing a patient for a procedure are uncomfortable for some, whether it’s being put under with full anesthesia or simply being injected with a numbing agent. Fortunately, those who hate needles may have nothing to fear in the near future. A study by the University of Sao Paulo in 2016 considered a new possibility where a numbing gel is applied topically. The dentist then uses a small electric current to encourage full absorption of the numbing agent by the skin. In addition to being pain-free and not enduring the unpleasant sensation of a needle, patients of this burgeoning method may relax more easily. It also saves time with patients who would be overly nervous about receiving a needle and has virtually no risk of contamination, which is one of the other common fears with needles. While still too new to be common, this is an example of how with dental technology, there’s always something even better on the horizon. Today many dentists have far better options for diagnosis, patient comfort, and general dental care and maintenance compared to 10 years ago. It’s best to visit the dentist at least once a year, and if you’ve been avoiding the important checkup, give it a chance. You’ll be surprised how much simpler things have gotten for dentists and their patients. What are Dental Bridges and How Do They Work?